Responsible for one remarkable record which, a decade later was covered – rediscovered might be a better word – by a big name group. 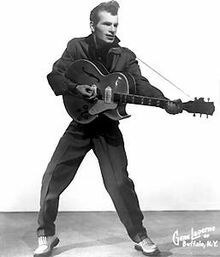 Responsible also for one remarkable image which, over the years, has come to be recognised as THE portrait of the archetypal rockabilly singer strutting his stuff. Serious followers of the Beach Boys will be aware of the song. 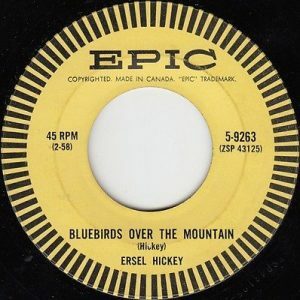 Bluebirds Over The Mountain, the group’s take on Ersel Hickey’s number which was released in 1968, a year or so after the artistic highs of Good Vibrations and Heroes And Villains. With Mike Love on lead and a rather manic backing it was a distinctly un-Beach Boys style track, though certainly not without appeal. Mind you, to these ears there was considerably greater appeal in the less cluttered Hickey original where the overall impression was of a Holly sound-alike, but not too much, singing a simple country flavoured tune streaked with melancholy (like Holly’s often were), over an unusual rhythm which had some similarities to early ska. Watching and listening to that clip again, a couple of things stand out: the massive pompadour hair styling, an affectionate nod to Mr Presley one would guess, and, the traces of Elvis in the voice – “wella, wella” indeed! With hindsight perhaps the record is more akin to Holly singing Presley’s Baby I Don’t Care. Every piece you read on Hickey has him falling under the influence of EP after hearing the Sun records – I Don’t Care If The Sun Don’t Shine usually gets a mention. Going back further still, Ersel O’Hickey was one of eight children, born in New York State in 1934 to an Irish father and a mother from Kingston, Ontario. Due to his father dying early and his mother having a nervous breakdown and being hospitalised in mental homes, Ersel’s formative years were largely spent in foster homes or with an aunt. At the tender age of 15 he started working the carnival circuit along with his sister “Chicky Evans”, an exotic dancer. According to the account on Ersel in the Rockabilly Hall Of Fame, his first influence as a singer was Johnnie Ray circa 1951. That was the year when he won the $500 first prize in an amateur singing competition. Come 1957, Ersel got himself his first record. The label was Fine Records out of Rochester, NY and for reasons not documented, our man appeared under the name “Mickey Evans”. One wonders if this was the alias he used on the carny circuit alongside his sister. The tracks were the self-written You’re No Good and the rather long-winded title, (I Want To Go Where You Go) Then I’ll Be Happy, an oldie. Listened to now, the record sounds like little more than a demo with Ersel accompanying himself on guitar and no one else present. However, the fact that he’d listened to those Sun discs is as clear as daylight particularly on the flip. The next thing to happen to the still relatively young Ersel has a distinct whiff of the apocryphal about it but versions of the story do appear in several places. Having been in Rochester, NY for a show, Ersel was in a restaurant afterwards when one of the stars of the show, Phil Everly, walked in. 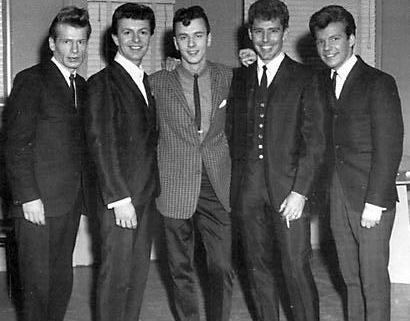 Ersel approached Phil and asked him, “I want to be a singer, what do I do?” to which Phil replied, “Well, you got to have a song” (quotes from the R&B Hall Of Fame piece). Ersel went home that night and wrote Bluebirds Over The Mountain. The following day he took the bus to Buffalo, determined to become a star. Quite why he went to Buffalo isn’t documented but one of the first things he did there was go to Gene Laverne’s “Studio Of The Stars” – Laverne was the photographer who his sister had used for publicity stills. Out of the session that ensued came the famous photo. Perhaps more important for Ersel at the time, was the fact that Laverne put him in contact with a man called Mike Corda who operated as manager and songwriter. Corda was so impressed with “Bluebirds” that he arranged to have a demo made and hawked it round the record labels. Epic Records, part of the mighty Columbia, were also impressed which led to the release of “Bluebirds” in January 1958. The record hit #75 in the Hot 100 and that was to be the peak of success for Ersel. Epic kept faith with him until mid 1960. He then moved to Kapp for a couple of singles, then Apollo which went bankrupt and then Laurie. After that, releases started to get much more intermittent though Ersel managed to achieve something of a living from his song writing. He died in July 2004, an almost totally forgotten man. He was white. He was influenced by Presley and it was the fifties. So the music he made had to be rockabilly, or that’s what you’d think from articles, e.g. 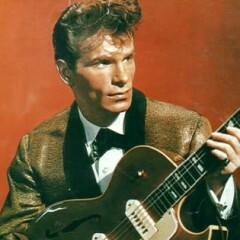 “Ersel … was an American rockabilly singer best known for his song “Bluebirds Over The Mountain” (Wiki). Well, yes and no. Certainly touches of Presley, and to a greater extent Holly, are in evidence on much of his fifties and early sixties output, but there’s little that you could really define as rockabilly. Indeed, even the hints of country present are usually little more than hints, unlike most rockabilly singers. But I’d be doing Ersel a massive disservice if I chose to ignore Goin’ Down That Road, the flipside of his second Epic single. It’s one that deserves to be in everyone’s list of favourite rockabilly tracks. Okay, there’s no slap bass – perhaps New York hadn’t heard of slap bass – and there’s no Scotty Moore style guitar, but the axe break when it does come is just fine and the strong acoustic rhythm sound drives the number along very nicely indeed. It’s Ersel who makes the record though. His opening is straight blues with each of the first pair of lines broken into three – “Goin’ down”, “that road”, “feelin’ kinda blue” with the release on the last phrase, and the final line “And I got no word, I got no letter from you, stay true” more flowing but still in the three part pattern. The intensity doesn’t even drop in the chorus which is all “Boom-chicka-boom-bop-bop” echoing the road noise I would guess. 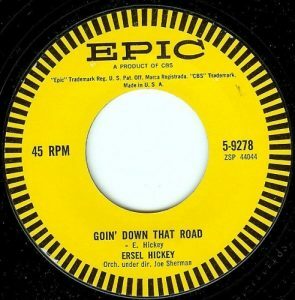 If Goin’ Down That Road was the high point of Ersel’s rockabilly efforts, then Hangin’ Around, the flip of “Bluebirds”, might be seen as a trial run. This one is a little more laid back than Goin’ Down The Road but it benefits from a good effort at the slap bass sound from Mike Corda. It also stands out by the manner in which Ersel drops an octave for the final syllable of each line; an unusual effect but one that catches the attention. Ersel’s only other track that could really be called a rocker was You Threw A Dart which appeared on the A-side of his fourth Epic single. Almost everything about this one – femme chorus, over embellished final line of each verse, presence of a middle eight, cutesy lyrics, ricky tick rhythm – shouted commercialisation of the original rockabilly sound, something that wouldn’t normally find favour with me. And yet, there’s something about this record. Maybe it’s the aggressive intro which promises more than gets delivered or perhaps it’s the unknown session man with an equally aggressive guitar break which could have come from another record altogether. The rock‘n’roll thing didn’t last as far as Ersel was concerned. Either he convinced himself or was convinced by his manager or the A&R guy at Epic convinced both of them: pop was the way to go. Having said that, his second Epic single managed to have that curious mix of pop, rockabilly and country that you rarely heard but when you did it usually came from Ricky Nelson or one of those folk down at Sun Records. Lovers’ Land starts off all “Boy and a girl, hand in hand, strolling down through lovers’ land” but the chunk that has Ersel declaring “Walk” in a commanding manner echoed by his guitarist, could have come from Memphis. Stardust Brought Me You, a co-write and his last Epic A-side was probably his best teen pop effort. Simple but attractive melody line, lyrics that didn’t stray from cliché that had worked for donkey’s years but could still be effective and a delivery that once again was ever so slightly evocative of country, it deserved success but like all his post “Bluebirds” singles that didn’t happen. There’s a clear touch of Buddy Holly right at very end of Stardust Brought Me You. On an earlier record, You Never Can Tell, the Holly influence was all-pervasive, from the occasional hiccups in delivery to the construction of the song, which wasn’t put together by Ersel this time. I should also add that the number had nothing to do with the Chuck Berry single of the same name. My last selection under this general heading, however, owes more to the country feel of artists like Don Gibson and that Nelson man again, indeed there’s an explicit reference to Don’s Blue Blue Day nested within it. The record was Put Your Mind At Ease, and it was Ersel’s sole outing on Laurie in 1963. There’s another influence on this one though; that first line doesn’t half sound like El’s Don’t Be Cruel. Ersel hadn’t quite got over his Presley infatuation. A curious heading perhaps in an article on a 50s/60s pop singer but there were certain offerings that emerged from the Hickey stable which didn’t usually achieve selection status but they had something about them which warranted at least a comment or two. Teardrops At Dawn, the first of his two Kapp discs in ’61 almost got in on title alone. However, what’s remarkable about it isn’t merely the pistols at dawn touch, no, it’s the “jisisum” sounds that Ersel makes presumably to evoke teardrops. That said, the track, which has almost a Bert Berns production feel about it, unlike most of Ersel’s work, starts superbly but then the melody line seems to go to unexpected places to the extent that the natural flow that you anticipated largely disappears. It’s such an oddity though, I decided to keep it in. One that definitely did not make the cut was the Hickey take on Adam Faith’s What Do You Want. The curious aspect of this record is the sheer fact that an American record label had chosen to cover a British hit, something which was very very rarely done, the boot was almost invariably on the other foot. The Faith original which itself owed a considerable debt to the Buddy Holly pizzicato strings arrangement on It Doesn’t Matter Any More, is actually more rocky than the Hickey cover. Certainly the Hickey record brought nothing new to the table. Oldies weren’t something that you’d have expected from Ersel so his takes on the Rodgers & Hammerstein show tune Some Enchanted Evening and Irving Berlin’s Blue Skies were unusual records in the context of sixties output– the second of this duo actually came out in ’67 in the era of psych! While Blue Skies was played with a straight bat, there seemed to be more of a serious attempt at reinvention on Some Enchanted Evening and I did consider putting it on my list. Four stars for effort perhaps. So far, so good, but if you manage to decipher some of the later lyrics – I should warn that it’s far from easy – you’ll hear that “The Queen of England called” and pretty soon, Ersel is meeting up with “Prince Charlie”. I said this was a curio. Maybe this wording accounts for the alternative title! I’m not going to claim that Ersel Hickey was an unsung hero, someone whose talent has been ignored for decades. He’s more akin to one of the foot soldiers of rock and roll as those lovely people at Ace UK call them. A man or woman or group who made one or two records which touched us briefly, who mingled with some of the greats for a year or possibly less, and then disappeared as far as the public were concerned. I didn’t know much about Ersel before embarking on this exercise but it was highly enjoyable doing the research. It’s sometimes at this point in a Toppermost that I dig out a live clip which shows our hero/heroine performing in more recent times. There is precisely one such clip of Mr Hickey on YouTube and it gives us 3:43 minutes of a lo-fi Ersel doing his thing in the Oneida Casino, Green Bay, Wisconsin in 2002 at the Rockin’ 50’s Festival. And no, I don’t recognise either of the numbers – there’s the closing minute of one and then a second number in full – but it’s good to see that Ersel was still rocking out in 2002. 1. The Beach Boys weren’t the only artists to cover Bluebirds Over The Mountain. Ritchie Valens did justice to the song and it appeared on the first (eponymous) LP to appear after his death in 1959. The Echoes, a white vocal group from Brooklyn put out a version in ’62. They made a feature of Ersel’s “Wella, wella” in the backing. More recently Robert Plant included his rather different take on the song on his 2017 album, Carry Fire. 2. The Beach Boys flip to Bluebirds Over The Mountain possibly roused as much if not more interest/controversy than the A-side. The song appeared on the record as Never Learn Not To Love with song writing credit given to Dennis Wilson. In fact the song came from Charles Manson and was originally titled Cease To Exist. Dennis was the one member of the Beach Boys who was friendly with Manson though over time he did put distance between them. While he, Dennis, made some changes to the lyrics of Cease To Exist prior to recording it, that didn’t give him the right to remove Manson from the credits. There is a story that Dennis gave Manson a sum of money and a BSA motorcycle for the song but I don’t know how much credit to give it. 3. Ersel’s forename came from the family doctor, Dr. Ersel (source: Wiki). 4. Johnnie Ray was a white American pop singer whose period of chart success preceded, but was also partially congruent with, the big name rock’n’rollers. He differed from the crooners of the 40s and 50s in that his singing was often more obviously emotive than the more stoic types like Sinatra and Bennett. Titles like Cry and What’s The Use give a clear idea of the type of songs he preferred. These days he’s hardly remembered at all but he was influential for a spell coming between the jazz oriented night club singers and the let-it-all-hang-out soul music people (and I’d widen that last term to include the likes of Charlie Rich and Elvis on slowies). 5. I was curious about the origins of (I Want To Go Where You Go) Then I’ll Be Happy which Wiki informed me was an oldie. A further dig into Wiki-land told me that it was a jazz standard written by Lew Brown and Sidney Clare and was first published in in 1925. YouTube yielded a rendition of the number in 1927 by Josephine Baker though there were versions by Bing Crosby, Eddie Fisher and Dinah Shore in the mid fifties which is likely to be how and when Ersel heard it. 6. The demo made of Bluebirds Over The Mountain coupled with Hangin’ Around featured Ersel on vocal and guitar, Mike Corda on bass and a session man called Jimmie Mitchell on guitar. Epic liked the demo so much that they decided to release it as the single. Hence the lack of drums. The ska or rock steady rhythm emanates from the Corda bass. According to the Rockabilly Hall Of Fame, the percussive sound heard on Hangin’ Around was Jimmie Mitchell tapping on his guitar case. 7. 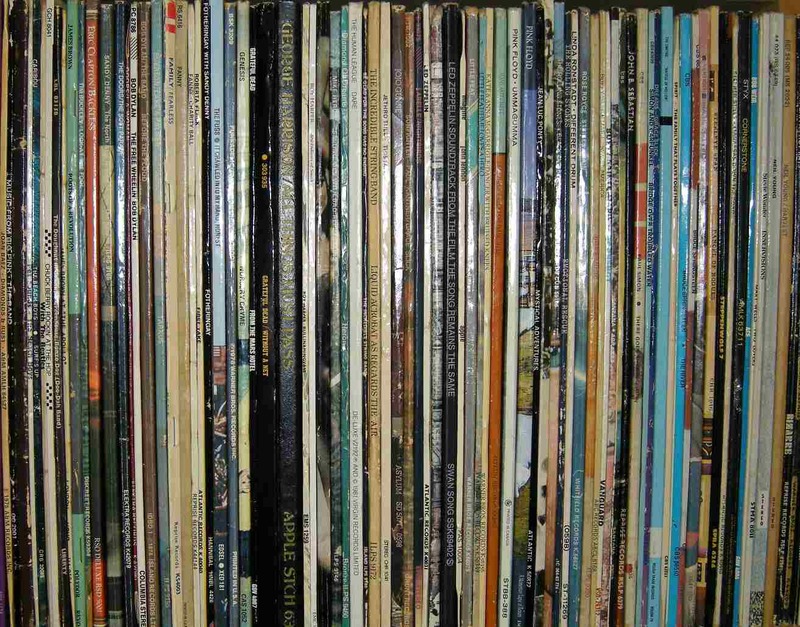 Janus Records was formed in 1969 as a joint venture of the American label GRT and the British label Pye. Much of the output came from Pye, giving artists like Status Quo, Mungo Jerry and Al Stewart direct access to the US market. 8. Some explanation is perhaps necessary for wording of the title of the Bear Family album Hangin’ Around At Heartbreak Hotel. I’ve not mentioned Heartbreak Hotel as being a song performed by Ersel but that’s because the album contains a number of unreleased tracks and the Presley cover is one of them. I’m not overly impressed; it’s more like a pastiche. However for the reader, this is it. Note that Ersel occasionally drops in his party trick of alternate high and low singing. My view, for what it’s worth, is that this is Mr Hickey having a bit of fun. He certainly deserved to make it to Buddy Knox kind of fame. He’s on this Account cd I bought Rocking from Coast to Coast vol 2. Dave, thanks for a fascinating Toppermost and because his name is Hickey, we are going to have to claim him as Irish. And what a fine record ‘Bluebird’ is. Thanks again. Mike and Andrew, belated thanks for your comments. I think the Buddy Knox comparison is quite apt. And, with great respect to the Irish, I don’t think even they could have come up with a forename like “Ersel”. Mind you “Aaron” wasn’t the most common of names either and who was Ersel’s hero?